This past year I have had to face the underbelly of my love of Zion. Like so many American Jews, I had been raised with the unquestioned narrative about Israel's righteousness, its humane practices, and the moral high ground upon which its policies are based. The painful deconstruction of these beliefs began with a journey through the Occupied Territories, where I encountered the shocking effects of my people's fear. I saw a land sliced by concrete and barbed wire, a snaking wall 450 miles long. Yes, there has been good reason for fear—genuine security threats that have come through the gates and checkpoints. Nevertheless, I found myself questioning the holding back of women in labor, children in need of emergency blood transfusions. I heard stories, not only from Arabs but from Israeli soldiers who struggled to "carry out orders" while innocent women and children died before their eyes. In Judaism, saving and defending life trumps almost all else. But does this only apply to Jewish life? I found myself wondering how this ethic measures up against the negative effects of the wall—the many Arab villages lacking potable water, farmers denied access to their land, the uprooted olive orchards and confiscated fields … Could this possibly be within the moral code of our people? 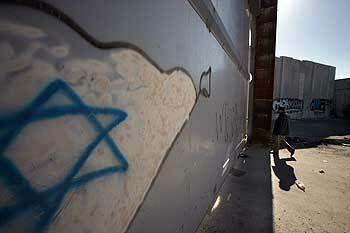 Most American Jews visit Israel, see the wall, stop, and say: Whew, glad that's there! We are told the wall keeps us safe from terrorists. The reality of that safety is unquestionable. But few people ask: What's on the other side? What we Jews see from the super highways is quite lovely in places—decorative panels of wood and brass. But on the other side lies the shadow of Zion: cement and razor wire; graffiti-art (a majestic dove caught in barbed wire, a horned, ghoulish Statue of Liberty, women crying); words that made my eyes stream: "Don't they remember the Warsaw Ghetto?" "We are not all terrorists!" and closer to the settlements, "Death to the Arabs." This wall was prompted by cumulative terror, by possible explosions at any bus stop or café, by the horror of people like you and me, on their way to work or having dinner with their family, being blown up. Yes, suicide bombings have significantly lessened since this wall was built. Yet it seemed clear, as I went daily from the territories into Israel, that many Israelis know little or nothing of the humiliation, loss of morale, and loss of life that occurs behind the wall. It is understandable that our brothers and sisters in Israel want to get on with normal life, and they need security to do so. But how can this situation really produce long-term security? Traveling through this territory, seeing these things, I found myself whispering over and over: What is happening to us? How did we get here? Once we were victims, now we are seen in the world as the aggressor, the oppressor who bulldozes orchards, dictates lives, and spells ruin for others. God forbid this be the new image of Jew! God forbid this be our new narrative! I was brought to the edge of my faith witnessing this formidable challenge to our ethics. While genuine mortal threats must be taken seriously, we must confront another, more insidious enemy that comes from within. It lurks in our blind spot, and for this reason is more dangerous to our security than any outer enemy. That enemy is our fear, and we are in danger of being held hostage by it. Like our ethics, fear has been inculcated into us Jews. It lives in our cells, full of real trauma and suffering, centuries of expulsions and pogroms, ghettos and methodical extermination. And to some degree, fear is wise. As Hannah Arendt said, fear is an emotion indispensable to survival. But when fear threatens the principles upon which our existence is based, when fear for security holds our ethics hostage, then fear becomes the sovereign power in our lives, and justifies any action. What an incredible metaphor this "security barrier" is for our own lives! We all carry fears and build walls that shape the landscape of our days. But at what price? Walls keep us safe, but lonely; highly functioning, yet disconnected; protected, but also numb. And the same goes for nations as for individuals. The danger of our barriers is a kind of sclerosis of the soul, a deadening of our humanity. It's risky for Jewish leaders to criticize the wall and Israel's occupation—most submit to consensual silence, another kind of deadly wall. But we must choose: Risking one's reputation or not speaking and risking one's soul? I pray we be given the courage to break down the walls of cement and silence, that we might reach beyond our fear and return to our simple humanity—therein lies our greatness, therein lies the redemption of the Zionist dream. Tirzah Firestone is an author, psychotherapist, and spiritual leader of Congregation Nevei Kodesh in Boulder, Colorado, where she is the founder of the Palestinian-Jewish Listening Circle. This article was written for the Common Ground News Service.